Friendly Safari Faces Wooden Puzzle is rated 4.6 out of 5 by 12. 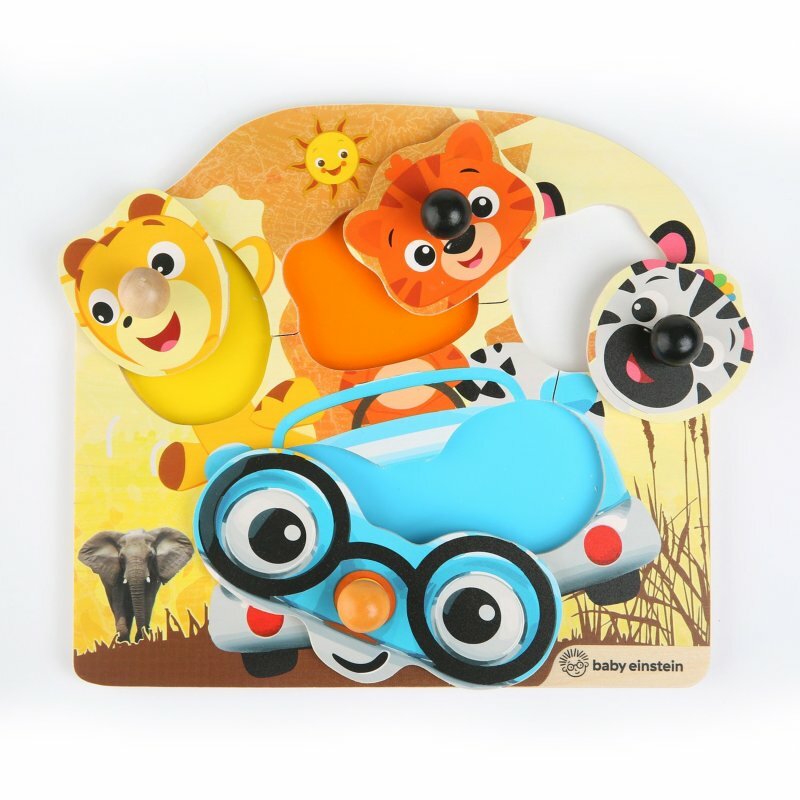 Take your little one on a wild ride with her favorite Baby Einstein characters as she plays with the Friendly Safari Faces wooden puzzle. This classic toy will introduce colors and shapes to your toddler as she works hard to fit the right pieces in the right slots. Puzzles spark curiosity and problem solving. With an action-packed scene to recreate, she’ll put her motor skills to work. As baby experiments with the chunky puzzle pieces, you can help her start identifying the different shapes and colors in the picture. Created in partnership with Hape, this beautiful wood puzzle features durable pieces that make this toddler toy one she’ll go back to again and again. Dimension (in) 8.75" x 8" x 1.125"
Rated 5 out of 5 by Ewebs from Very cute and simple puzzle for my toddler My 2.5 year old really loves this puzzle. It's simple enough that he can do it by himself and gain confidence, and he really loves putting it together and then dumping out there pieces and doing it again. Rated 5 out of 5 by Agarner from Absolutely adorable and perfect for little hands! Such a cute little puzzle! My 5 month old could easily pick up all the pieces by the handle. While he's not capable of putting the puzzle together yet, the pieces will easily fit in place. Rated 4 out of 5 by RiversnIsles from This puzzle makes me smile My 18 month old and 3 year old play with this toy anytime I set it out. The characters are colorful and cute. The characters eyes are inviting. Rated 5 out of 5 by Greenwald from Good Kids toy for different shapes Really good toy for teaching kids non-standard shapes. My daughter plays with it, so it seems excellent to me! It's pretty simple, nothing crazy for them to understand.